A shepherd riding on a bus while working in the socialization program. We do not stop socialization at the puppy level. We continue to advance a dog for as long as he/she is with us. 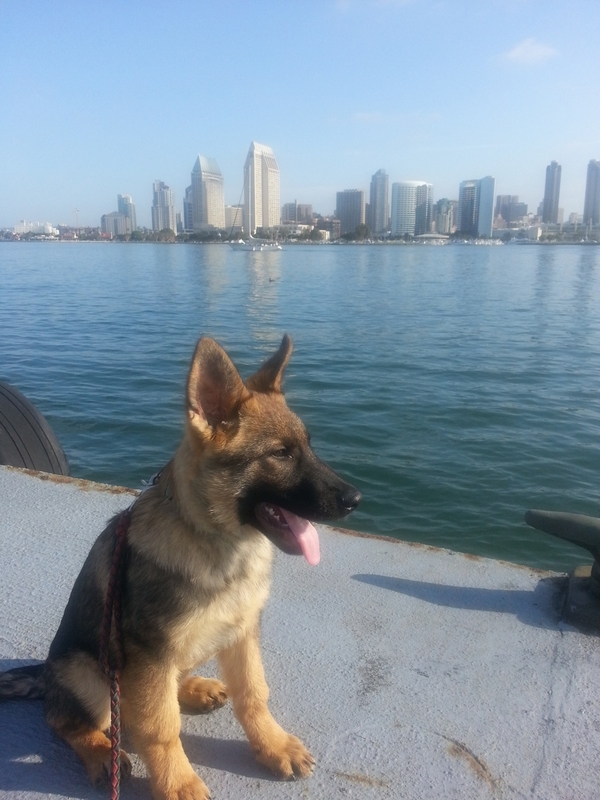 This pup will make a well rounded family companion or she may be selected for service work. The puppies we choose for our "step-above puppies" and young trained adults must have a low to medium energy/drive. Watch the Leerberg video on YOUTUBE...So You Think You Want a High Drive Puppy. What do we look for in the optimal Tre'Good family dog ? Well, that is a story that began a few decades ago. I had a lower energy family companion German Shepherd as a child. A dog who was intuitively intelligent, calm and loved everyone. He was never aggressive towards anyone who entered our home. He was an all around great guy named Yogi. One hot summer night my father was watching T.V. in the living room while my mother was tucking us kids into bed. Suddenly we heard a loud commotion in the living room. My mother handed me the dog by the collar and told us to stay in the room. Shortly after she left us, we heard her screaming. I quickly opened the door and let Yogi out, truly expecting nothing from our family pet, but holding tight to a child's belief that our loyal friend would save us from the source of the terrifying sounds coming from the living room. Only moments after Yogi shot down the hallway, we heard the intruder screaming. A large man high on drugs had busted through our screen door and begun to beat my dad with one of our heavy oak dining room chairs. When my mother came out, he turned on her but could not hit her before Yogi lunged through the air at him. Yogi proceeded to attack the man while he ran through a glass door and down our driveway. Yogi ended the attack at the end of the driveway and returned to sit by my father who was laying on the living room floor. My father suffered a cracked skull, broken ribs, and a punctured lung during the attack. My mother was unharmed--saved by Yogi's timely entrance. When the paramedics entered the house and began to help my father, Yogi never made an aggressive move towards them. He sat quietly by my father until the paramedics took him to the hospital. My father spent six weeks in the hospital but is alive today because of the intuitive intelligence, problem solving abilities, and love of an amazing breed of dog. The story explains why we have become so very specific about the dogs we train and breed. I began breeding German Shepherds in my late teens and twenties. When I became a mother I decided to let my line end and focus on my family. Later in life, I decided to buy a German Shepherd for my family. I was shocked when I had to reject dogs for being too aggressive, high energy/drive, or just plain neurotic. These were not the dogs I grew up with...so I began to do research. 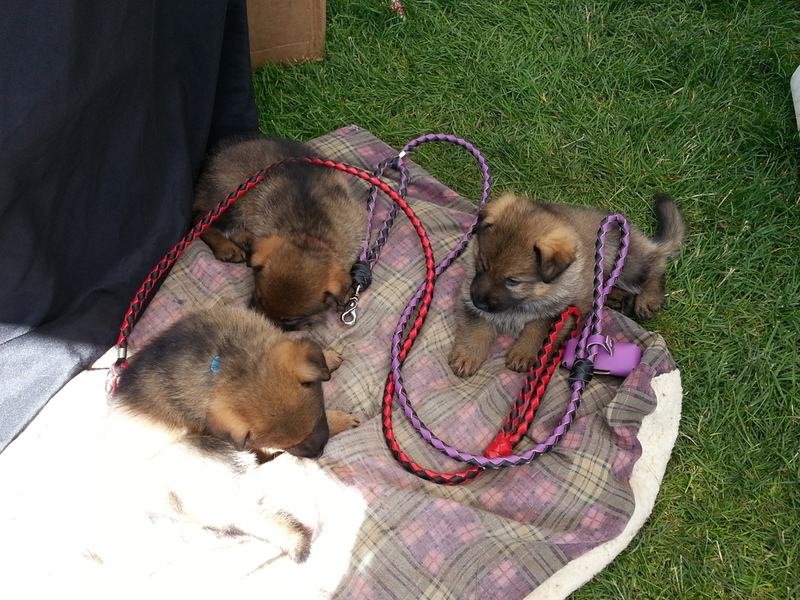 I learned that many German Shepherd Dogs are now bred for sport rather than for family life. I have nothing against sport or dogs bred for police work, but they do not always make the best family companions. Selective breeding for traits such as aggression (sport) and high activity levels (sport) greatly increase the risk of behavior problems that a normal family cannot handle. When a dog is bred strictly to produce puppies that will title in sport or conformation, family companion traits can be overlooked. I believe that the naturally protective German Shepard Dog should also be available to families--not only for show and work. Steve Zawistowski PhD, CAAB mentioned during a lecture he gave at the 2015 Society For The Promotion Of Applied Research In Canine Science (SPARCS): If we want to keep dogs out of shelters some breeders could do a better job of breeding for companion dog traits in our working dogs. Families want specific breeds because of the traits they are known for. They do not want the over the top working characteristics that are being focused on for the show ring. A percentage of breeders should focus on working traits but not all. At Tre'Good our main focuses are family companion and service dog traits and intelligence. An intelligent German Shepherd with a balanced temperament will protect the family it is bonded to. I personally would not own a German Shepherd that was trained to attack humans when we had children and teenagers running in and out of our house. I do not recommend an attack trained dog for families. These dogs should only be owned by experienced handlers. We have a large extended family. During family gatherings we have toddles and children running around. A stuffed animal or a blankie in the arms of a child can look very much like the sleeve attack dogs are trained to. All dogs think for themselves and they are never 100% under our control. Serious injuries have occurred with dogs trained to attack. Training a dog to bite a person is a game changer. We will only live with and breed dogs that can sense the difference between someone we accept and someone that means us harm--we should not have to tell them the difference. "Not everything that can be counted counts; not everything that counts can be counted." http://documentaryheaven.com/bbc-pedigree-dogs-exposed/mentary Pedigree Dogs Exposed. And also watch, Pedigree Dogs Exposed; Three years on. Our training methods are designed to enhance the natural, healthy mental outlook of a well bred German Shepherd. Fear or physical pain is not used to compel desired training results quickly. The relationship we create with or dogs warrants a powerful loyalty to their handlers. Our methods may take longer, but our dogs know that learning is fun and safe. They understand that the effort they put in trying to meet our desires will be rewarded. Our training methods utilize positive reinforcement, brain games, play, differing routines, and other proprietary techniques. We also constantly change training locations and vary the experiences of our dogs to proof our training in the real world and to deflect training aversion caused by boredom and repetition. By constantly changing our routines, we challenge our dogs to stay in a problem-solving state of mind. We teach our dogs how to learn instead of using step by step, repetitive, mind numbing training programs. You might compare our training to problem based learning used in progressive schools around the country. We combine these unique training methods with play, fun, adventure and love to enhance what we call the "learning drive" in our puppies. Our dogs pure joy in their work or their "learning drive" is what makes a Tre'Good German Shepherd an exceptional friend and companion. Dogs working in the Step Above Family Companion and Service Dog Programs enjoy a myriad of socialization opportunities. All of our puppies go through basic socialization but Service and Step Above dogs have hundreds of hours added to the basic program. The older trained pups move further out into the world for a rich and deep experience of all things human. We never underestimate the fullness of our dogs life experience or their intelligence. Watch the clip below. Your dog will know the basic obedience commands, but we also train our dogs in what we call functional family obedience. We prefer, like you, to take our dogs with us when we go out into the world. So we have developed a training program that is functional in the real world. We have also developed unique commands that make traveling with your dog an easy, smooth process. A dog that is well behaved in daily life and in public situations is allowed many opportunities for environmental enrichment.They are easy to be with in all circumstances, which allows the dog a full life and fulfills their deepest desire to be with their handler as often as possible. We put tremendous effort into our training program so you can know the joys of dog ownership but also so your dog can have the life s/he deserves..
Aja working on her under the table skills during a restaurant meal. We look for difficult table configurations so she is prepared for what ever she may encounter in the real world. This type of training also make slipping under a booth easy as pie.